This kit includes pre-painted parts with high levels of internal and external detailing also included are two paper coloured options for name boards. Almost all walls are double skinned for strength and to enable detailing inside and out. This is a feature building designed to work with a sub base and boardwalks (both have been included with the kit). 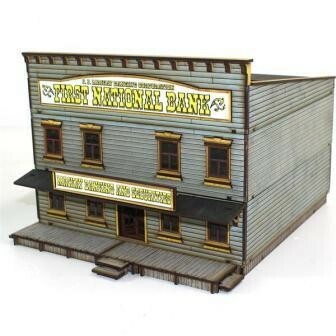 North America’s original ‘first’ national bank was chartered in 1791, lasting for just over 20 years. After the war of 1812 (in 1816) a second (first) national bank was chartered but by the 1830’s this was considered a corrupt institution and in 1836 it did not have it’s charter renewed. With all federal payments having to be made with either gold or silver the economy went into a four year recession. From 1837, without a National Bank for North America, individual States started to charter their own National (State) banking corporations. With these new chartered National (State) Banks, States had enabled the printing of paper certification (bank promissory notes), rather than other forms of barter/payment. All this enabled better transfer of funds and so enabled renewed commercial growth. Within only a few years there were many hundreds of State chartered banks (the first one chartered in each State would style itself ‘First National Bank’ for that state). This period until 1863 would be remembered as the age of ‘Wildcat Banking’. These State chartered bodies were primarily in business to make wealthy individuals lots and lots of income from handling others’ money and on average ‘wildcat’ banks lasted less than 60 months before closing. In 1863 the federal government again issued federal charters to all good banks (by this time 1,500 banks) within the Federal States of America, though many old ‘First National’ State Banks still retained ‘First National’ as prefix to their name. James, John, Mackay was born in Glasgow, Scotland, during the 1820’s, as a young man he went to university to study mining. In his late twenties, in 1849, Jamie Mackay was just one of the many professional mining engineers who found themselves in North America and heading west along with the masses of wannabe miners hoping to strike it lucky. Jamie didn’t do too bad mining but he was a born business man and realised there was guaranteed good money to be made supplying wannabe miners with their material needs. He soon became a well respected leading figure in the State’s business community and it was no surprise that he was the first to gain a Banking Charter from the State. The Dead Man’s Hand branch of Mackay’s First National Bank is only one of a dozen or more such branches in towns across the State. It’s hardly surprising this banking corporation does so well offering personal banking and securities when bandits and road agents know J. J. Mackay only hires the services of fellow Glaswegian, Allan Pinkerton’s Detective Agency to protect and regain stolen valuables on deposit with J.J. Mackay’s Bank, after all everyone knows Pinkertons never sleep!